View your videos and photos from your Apple iPhone, iPad or iPod on your big screen HDTV. Send music from computer, iPod or iPhone to loudspeakers wirelessly. There are many ways to send content from Apple products to your TV and other audio/video destinations. You can connect a cable or go wireless. Put your slides, movies, photos, and everything else that fills your iPad or iPhone 4S screen on the big screen. The Apple Digital AV Adapter mirrors exactly what you see on iPad or iPhone so that everyone in the room can enjoy it on your widescreen TV, video projection screen, or other HDMI-Compatible device. Use the Apple Digital AV Adapter to mirror whatever’s on your iPad or iPhone screen — apps, presentations, websites, and more — on your HDTV or HDMI-compatible display in up to 1080p HD (movies play at up to 720p). Apple does not use the micro USB port found on Android phones. Apple uses a proprietary port. The Apple iPhone has either the older, bigger 30 pin connection port or the new smaller 8 pin Lightning connection port. Get the appropriate cable to connect to iPhone. 1. Plug the cable adapter into your Apple device’s 30-pin connector. 2. Plug one end of an HDMI cable into the HDMI port of the adapter, and the other end into an available HDMI port on your TV. 3. Switch your TV to the appropriate HDMI input. For earlier models such as the iPhone 4, the original iPad, or the fourth-generation iPod Touch, the display won’t be mirrored, but it will show photos and videos in supported apps once you start playing them. Cost of the adapter cable - You may find the Apple digital adapter cable on E-bay for as little as $17 and up. AMAZON.COM may have the adapter cable as well. The Apple Store will charge more, around $39 and up. - Adapter mirrors exactly what you see on iPad 2 or iPhone 4S so that everyone in the room can enjoy it on your widescreen TV, video projection screen, or other HDMI-compatible display. The Apple Digital AV Adapter also supports video out for iPad, iPhone 4, or iPod touch (4th generation). How do I connect my iPhone 6 to watch video on my TV? The Apple iPhone 6 uses a smaller connection port than the iPhone 4, called Lightning. Lightning is a proprietary computer bus and power connector designed by Apple Inc. to replace its previous proprietary 30-pin dock connector, intended to connect devices like iPods, iPads, and iPhones. Using eight pins instead of thirty, Lightning is significantly more compact than the 30-pin dock connector and can be inserted with either side facing up. However, it is incompatible with cables and peripherals designed for its predecessor, unless used with an adapter. Lightning was introduced in 2012, and is used by the iPhone 5, the iPod Touch (5th generation), the iPod Nano (7th generation), the iPad (4th generation), and the iPad Mini. So you need to get the Lightning Digital AV adapter. It works the same way as the 30 pin cable adapter using HDMI to the TV. You could also get a small Lightning to 30 pin adapter plug for very little cost if you already have the older 30 pin adapter cable. 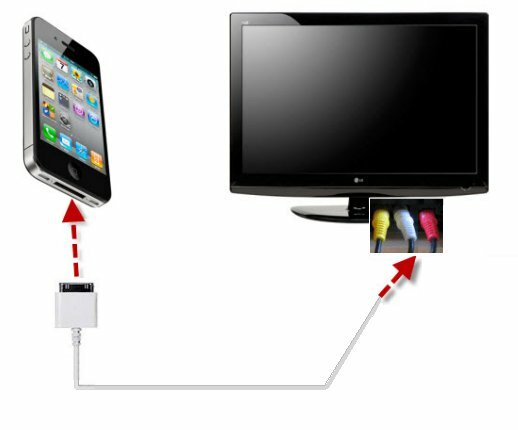 Use the Lightning to VGA Adapter to mirror whatever's on your iPhone, iPad, or iPod touch with Lightning connector apps, presentations, websites, and more on your VGA-equipped TV, display, projector, or other compatible display in up to 720p HD. Video mirroring is supported on all compatible devices. Watch video on the big screen in up to 1080p by connecting your device with a Lightning connector to a television, projector, or other VGA-compatible display. Video out supports up to 1080p for iPad mini, iPad with Retina display, iPhone 5, and iPod touch (5th generation). 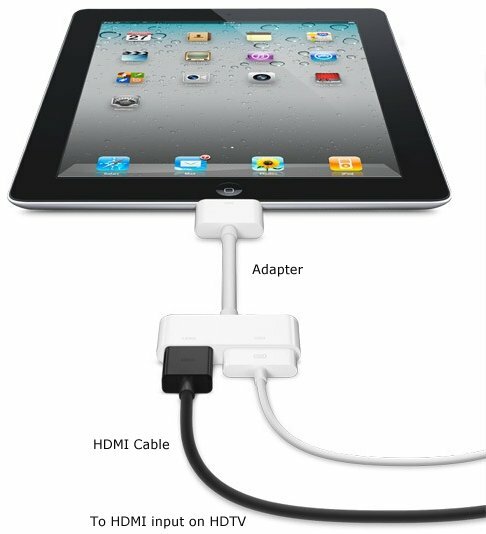 The Lightning to VGA Adapter connects to your iPad with Retina display, iPad mini, iPhone 5, or iPod touch (5th generation) via the Lightning connector and to your projector or display using the VGA adapter. Compatible with: iPhone 5 iPod touch 5th generation iPad 4th generation iPad mini. Airplay - AirPlay is a technology invented by Apple which allows users to broadcast audio, video, and photos to compatible Wi-Fi connected devices. AirPlay allows users to stream music, video, and photos from their iTunes library or iOS device (iPhone, iPad, iPod) to computers, speakers and stereo components, AirPort Express, and Apple TV (second-generation). Speakers, video devices like the Apple TV, and apps must be AirPlay compatible in order for the streaming to work and they must also be on the same Wi-Fi network. Airplay does not work on the original iPod Touch, original iPhone or iPhone 3G. Airplay requires iTunes version 10, iOS 4.2 or newer. iPhone 4S and iPad-2 support Airplay mirroring. 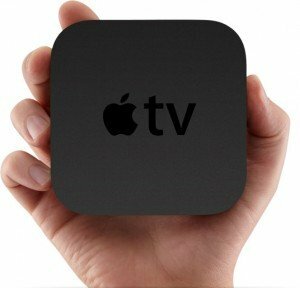 AirPlay Mirroring enables users of certain AirPlay-compatible devices to display whatever is on their device's screen on AirPlay-compatible Apple TVs. 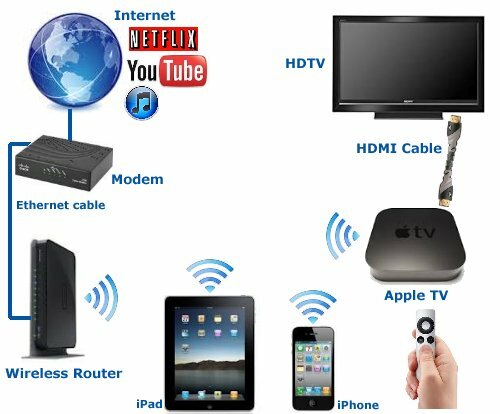 This allows users to show the website, game, video, or other content on their device's screen, on the bigscreen HDTV to which the Apple-TV is connected using Wi-Fi. AirPlay is an evolution of AirTunes, the system that allowed computers running iTunes to play audio through an AirPort Express or an Apple TV. AirPlay expands this to allow the remote playback of video on the second-generation Apple TV. 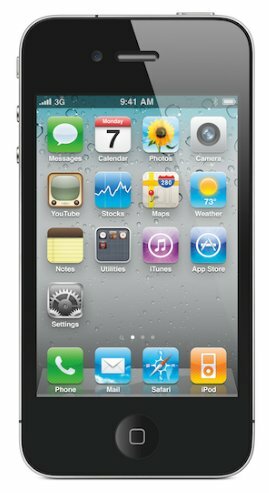 Any iOS device running iOS 4.2 can also send audio or video via AirPlay. AirPlay only works with video formats that the Apple TV supports. AirPlay only streams media from iTunes or iOS devices to the Apple TV (or AirPort Express routers) via your home Wi-Fi network. Apple TV - Apple TV is a digital media receiver. All content comes from the internet via your home network and broadband service or locally connected devices. 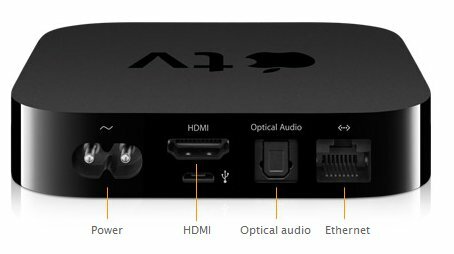 Apple TV outputs over HDMI to an HDTV and has Wi-Fi (802.11g/n) and ethernet connectivity. The 2nd generation Apple TV is much smaller than the 1st generation and has no disk drive to store content. Video formats supported include H.264, MPEG-4, motion jpeg. Photo formats jpeg, gif and tiff. Audio formats AAC, protected AAC, MP3, WAV, AIFF, Apple lossless. No TV tuner and no recorder. If your TV doesn’t support HDMI, or if it doesn’t have an available connection, you can link your Apple device to the TV set through an analog cable connection, using an Apple Composite Audio/Video cable. 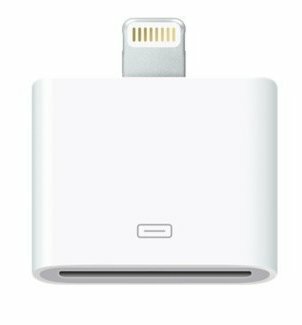 If you have the iPhone 5, iPhone 6, then use the composite AV cable adapter along with the Apple Lightning to 30-pin adapter plug. Apple Lightning connection to 30-pin adapter plug. 1. Plug the Apple analog cable adapter into your device’s 30-pin connector. 2. Plug the yellow video cable at the end of the adapter into an available analog video port on your TV. 3. Plug the red and white audio cables at the end of the adapter into the red and white audio ports corresponding to the yellow video input on your TV. 4. Tune your TV to the appropriate composite video input using the TV remote. 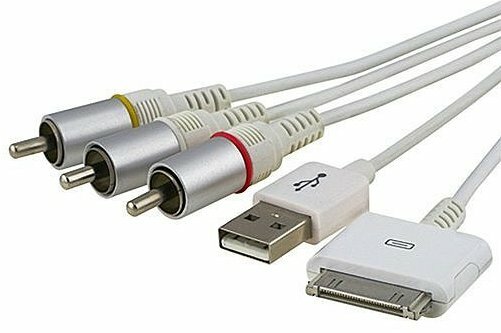 A wired connection to a TV can be a composite video cable or component video or HDMI. A wireless connection gets a bit more complex. Wired connection from iOS device (iPhone, iPad, iPod) to a TV set using RCA composite video/audio cables. Listen to music from iPod on home stereo. Connect to TV RCA video and audio inputs. For older TV sets with only yellow video input and stereo (white and red) sound. There are a variety of products for iPod, iPhone and iPad. Always check for compatibility due to the constant revisions of Apple software and hardware over time. Also Apple tends to want users to comply with and live within the Apple world which limits many possible options for Apple products. Sometimes you can override or remove the limitations with a process called jailbreaking. Apple warranties are usually voided if you jailbreak your Apple product although there are ways around this also. Apple fights jailbreaking but it has been declared legal by the U.S. government. Cydia is a third-party, independent installer application for iPhone, iPad and iPod touch. Cydia is developed by Jay Freeman (Saurik) and it’s similar to Apple’s app store. Cydia allows you to download tweaks & utilities that you may want to enhance your iOS device. Cydia brings you many applications that can be downloaded either for free or for a small payment using PayPal. The Apple TV device is small and lightweight. The device has 1080p video capability. Apple TV is one solution for a wireless hookup to iPhone. You still need a HDMI cable from TV to the device. 1. Make sure that your iPhone is on the same wireless network as your other AirPlay devices. 2. On your iPhone, double-tap the Home button. 3. Swipe the list that appears to the right, until you get to the volume and AirPlay settings. 4. Tap the AirPlay button to bring up a list of supported AirPlay devices on your network. 5. Tap the device to which you would like to stream. A TV icon next to the device indicates that you can stream images, video, and/or audio, while a speaker icon indicates that you can stream only audio. If you have at least a second-generation Apple TV and an iPhone 4S or iPhone 5, or iPhone 6, you can select Mirroring here to mirror your device’s display to your TV, wirelessly. Open the app with the content you would like to stream, and begin playing. If you don't want to use an AirPlay-capable device, you may be able to use DLNA instead. Today, many modern TVs support streaming from a local network (wired or wireless) via the DLNA (Digital Living Network Alliance) standard. If your TV supports DLNA (or just "UPnP") streaming, you can use your iPhone as a DLNA server. Download and install a DLNA-server app. To setup the Apple TV box, plug in an HDMI cable to the Apple TV box rear panel and to your TV HDMI input. Select the HDMI input on the TV. On the Apple TV, Go to Settings - General - Network and select your home router. You can manually enter IP address or DHCP. Select Internet - Netflix or YouTube. Turn on Home Sharing to stream iTunes content from your PC or Mac. Streaming audio and video from iTunes to iOS is built-in to iTunes, but it isn't under the banner of AirPlay. All you need to do is log into Home Sharing in iTunes on the computer holding all the media, then log into Home Sharing in Settings > iPod on your iPhone or iPad (on iPod touches, it's in Settings > Music). Now you should see a new "Shared" tab pop up in your iPod app (you might need to hit "More" to see it). From there, you can navigate to your iTunes library and play any music or video from that library, including videos that weren't purchased on iTunes. If you want to stream from non-iTunes sources, you're out of luck for now—Apple keeps pulling apps that let you do this from the Apple App Store. 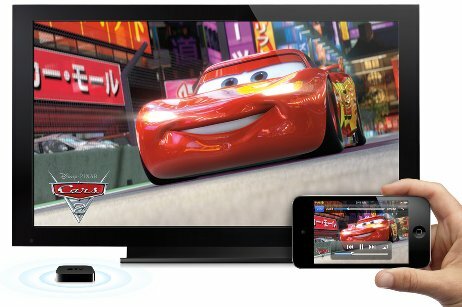 With AirPlay, you can wirelessly stream what’s on your iPhone, iPad, or iPod touch to your HDTV and speakers via Apple TV. Or mirror your iPad 2 or iPhone 4S screen. To mirror your iPhone 4S or iPhone 5, or iPhone 6, you need to double-tap the home button, bringing up the app-switching tray. Swipe from left-to-right two times, revealing a volume slider and the AirPlay icon. 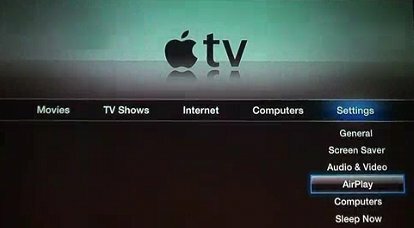 Tapping on the AirPlay icon will reveal any Apple TV-compatible devices currently connected to the same Wi-Fi network as your iPhone 4S or iPhone 5. Select the device to which you would like to mirror your iPhone. Toggle the Mirroring switch to On. Once mirroring is enabled, the status bar on your iPhone will turn blue and have an AirPlay icon next to the battery meter. This serves as a reminder that everything you are doing on your iPhone is being displayed on your TV. You need to have the latest Apple software available loaded on Apple TV box and iPhone / iPad2. DLNA was established by Sony in 2003. Digital Living Network Alliance is a standard which, if your devices are DLNA certified, allows sharing of digital media such as music, video, photos and more between your networked devices. Your network can be wireless (Wi-Fi) or wired (Ethernet). You want to share your smart phone digital media with your TV. Your TV must be DLNA certified and connected to your home network. 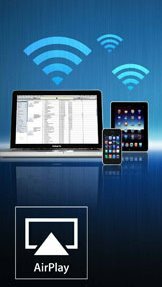 Your smart phone must have an app for DLNA sharing and be connected to your home network. Run the app on your phone, select the TV as destination and select the media to play. DRM - Even though both your server (media source) and client (destination) are DLNA certified, DRM (Digital Rights Management) may still prevent you from sharing media. DLNA attempts to connect certified consumer electronics products but sometimes things do not work out. Over 250 manufacturers are part of DLNA but some have their own take on things. File formats are another problem. One device may not play a certain video file format or may have restrictions preventing you from viewing content. In a perfect world DLNA works brilliantly. UPnP is a set of network protocols which allow devices to discover each other on a network in order to share data. DLNA uses Universal Plug and Play (UPnP) for media management, discovery and control. New TV sets from LG, Sony, Vizio, Samsung and others link internet to HDTV. • How much does it cost to run my TV? Remember, a cable connection diagram is only one part of the total solution for getting your system working to perfection. You also need to know how to select the proper input on your components and how to setup on-screen menu options and other audio/video knowledge. Put your slides, movies, photos, and everything else that fills your iPad 2 screen on an even bigger screen. Apple Digital AV Adapter also supports HD video out for iPad, iPhone 4 and iPod touch (4th generation). 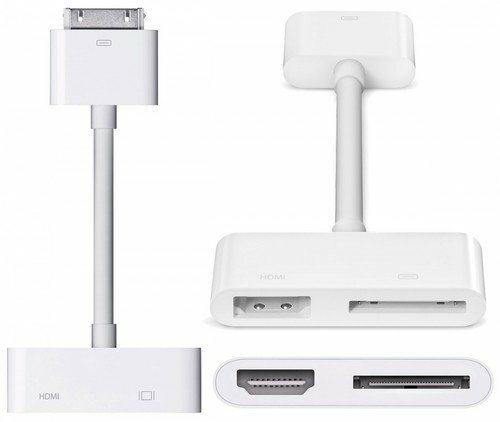 Apple Digital AV Adapter mirrors exactly what you see on iPad 2. If you have an iPad, an iPhone 4, or a fourth-generation iPod touch, Apple’s Digital AV Adapter finally makes it possible to output HD video (with audio) from your iOS device to your HDTV. The Apple Digital AV Adapter mirrors exactly what you see on iPad 2 so that everyone in the room can enjoy it on your widescreen TV, video projection screen, or other HDMI-compatible display. The Apple Digital AV Adapter also supports video out for iPad, iPhone 4, or iPod touch (4th generation). The adapter itself has two ports, one HDMI female port and one standard female iPod connector port. This permits you to power/charge the iPad or iPhone while simultaneously outputting video and audio. Connect the Apple Digital AV Adapter to your iPad, iPad 2, iPhone 4, iPhone 4S or iPod touch (4th generation) via the 30-pin dock connector and to your HDMI-compatible display using an HDMI cable (sold separately).